Distinguishing Characteristics Hispanic female. Brown hair, brown eyes. Mya's hair was dyed blonde at the ends at the time of her disappearance. She wears eyeglasses and may use the last names Ayala Orellana and/or Orellana. Her ears and the left side of her nose are both pierced. 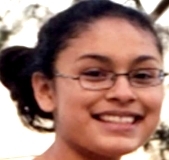 Mya disappeared from La Verne, California on April 23, 2015. Authorities believe she left of her own accord. Few details are available in her case.